Unlike most Americans Hillary Clinton knows the identity and accomplishments of the nineteenth century lawyer Belva Lockwood. It was not always the case that men and women in the United States could not I.D. Lockwood. She was, after all, the first woman to run a full campaign for the U.S. presidency, with electors pledged to her and votes tallied. She ran in 1884 on the Equal Rights party ticket, and again in 1888. (Victoria Woodhull announced her candidacy in 1870 but did not organize a full campaign. She ran afoul of federal obscenity laws and spent Election Day in prison). Lockwood entered the 1884 race as an expression of ambition and ego but also a clear-sighted move to show women’s serious intent to become full citizens in the American democratic experiment. She campaigned across the country, the candidate of the newly formed Equal Rights Party. Her costs were covered by giving speeches. One of her most popular was titled, “The Political Situation.”National and local newspapers covered Lockwood’s talks, and her platform. Magazine cartoonists initiated her into the brotherhood of male candidates by including Lockwood in their satirical drawings. After the election parents were known to name a daughter Belva in the candidate’s honor. And, like other famous people of her day, including Clara Barton, she was asked to endorse commercial products. 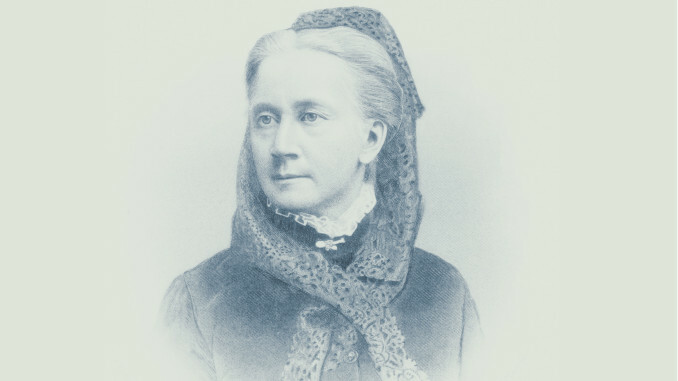 Lockwood was also one of the pioneering women lawyers of her day. In the early 1870s she attended the National University Law School in Washington, D.C. She and several other women were admitted as a kind of fluke. When it came time to grant her degree university administrators refused. Lockwood had to wage a fight to get it and to win local bar status. Later, when a client needed her to argue before the U.S. Court of Claims, which would not admit her to its bar, she went to Congress, lobbying for a law to guarantee that all qualified women lawyers would be admitted to the bar of the federal courts, including the U.S. Supreme Court. That contest took five years but Congress finally sided with her. On March 3, 1879, appearing in a plain black velvet dress, Lockwood was admitted to the U.S. Supreme Court bar, the first woman to have that privilege. This successful fight was broadly covered by the press. I can only guess at how Lockwood’s star dimmed. First, and perhaps most important, textbook authors chose to make the iconic Susan B. Anthony and Elizabeth Cady Stanton the focus of the women’s rights story. Somewhat astonishingly, Lockwood (and Woodhull), as early presidential candidates were not mentioned. Similarly, discussions of women and work in the nineteenth century focused upon exploitation of poor and working class women, and said little about the struggle of upwardly mobile women to become professionals. Surely, the story of Lockwood’s successful fight to drag anti-discrimination legislation out of the U.S. Congress might have presented a heart-warming civics lesson in any high school or college textbook. Twentieth century publishers also account for some part of the dimmed star. Until NYU Press showed its support for biography and women’s studies, and put out my adult-reader biography of Lockwood in 2007, publishing houses had deemed her only worthy of biographies meant for children. Documentaries and museum exhibits also largely ignored Lockwood and her contemporaries, again using Stanton and Anthony to cover all historical bases. Hillary Clinton’s fame, of course, is currently worldwide in scope. Like Lockwood, she has been active on a national and international stage for several decades. But she differs significantly from Lockwood in having held several formal positions of note before becoming the presidential nominee of a major party: first lady, senator, and secretary of state. She has been much written about in these roles, and has herself written several memoirs. Television and social media, unknown of course in Lockwood’s day, are awash with Clinton text and images. Could a woman candidate such as Clinton be washed from history in a hundred years as Lockwood has been? It is, thank goodness, not likely. While authors still have considerable work ahead of them with respect to writing the role of women into history, the multi-fold nature of Hillary Clinton’s public roles and achievements seem to guarantee her place in that history. Jill Norgren is Professor Emerita of Political Science at John Jay College and the Graduate Center of The City University of New York. She is the award winning author of many articles and books, including Belva Lockwood: The Woman Who Would Be President (NYU Press, 2007) and Rebels at the Bar: The Fascinating, Forgotten Stories of America’s First Women Lawyers (NYU Press, 2013). This entry was posted in 2016 by Professor Ruth O'Brien. Bookmark the permalink.